A General Approach to CIM. Introduction to CIM. Technology and organization background for CIM. Implementing CIM. Creating a CIM concept. Integration processes and technologies. CIM and FCIM. Introduction to the Japanese CIM. CIM in Hitachi. A general Hitachi approach to CIM. The scope of CIM. Outline of the Hitachi CIM. Hitachi integrated planning methods for strategic information systems. The Assembly Evaluation Method (AEM). The automatic assembly line for Video Tape Recording (VTR) mechanisms. A CIM system for electrical appliance production. CIM and Concurrent Engineering: the MELCO case. The CIM concept and concurrent eningeering. The CIM models and subsystems. The production planning system and CIM. An application of production planning system. The case of the Nakatsugawa factory (NCIM) for customer-oriented CIM of Ventilators. Customer-oriented CIM in moulded-case circuit breakers. The implementation of the CIM/FA strategy. The Kernel of Toyota CIM: Mechatronic Network (ME-NET). A general approach. Mechatronics. A general presentation of ME-NET. ME-NET position in CIM. Technical presentation of the ME-NET. Communications functions in ME-NET. Benefits and perspectives of ME-NET. Conceptual Views for CIM. Ome Works Toshiba CIM (OT-CIM). General approach. Steps and campaigns for OT-CIM. Database and networks for CIM. Omron Corporation. Improvement information function for CIM. Conceptual approach to CIM. CIM concept in Toyo Engineering Corporation (TEC). Strategies for CIM Implementation. Tokyo Electric Corporation. Implementation of MRP system. Parts and work-in-process control system using bar code. Development of total productivity (TP) movement. Approach to CIM development. The need for CIM. CIM at the TEC Ohito Plant. Fanuc Ltd. The situation before CIM. Status of implementation of CIM. Shimizu corporation. Nippodenso Corporation. CIM, IMS and FGMS. Historical trend and future framework for CIM. The Sigma Project. Objectives, strategies and activities. Sigma system overview. FAIS (Factory Automation Interconnection System). The FAIS goals and FNE requirements. The FNE Plant systems. FAIS and MAP. The IMS programme. The concept of the CIM system in relation to the next generation. An overview of IMS. The significance of the word "intelligence". Some actual research programmes in IMS. Final Comments, and Prospects for CIM in Japan. The reality of technology and CIM in Japan. Definition, objectives and factors for CIM. Strategy and stages of implementation. Types of CIM. Planning and CIM reality. Networks for CIM. Problems and difficulties. Bibliography. 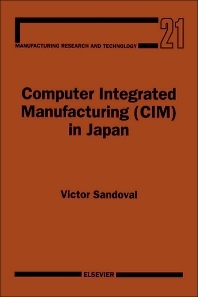 Presented in this book are some of the most relevant aspects of Computer Integrated Manufacturing (CIM) in Japan. The volume compares the development of CIM in the context of Japan as well as that of Europe and the United States. It includes studies of the implemented CIM systems in many companies. In addition, the book contains a study concerning Intelligent Manufacturing Systems (IMS), and the basis for preparation of the so-called Future Generation of Manufacturing Systems (FGMS). This volume gives a better understanding of Japanese competitiveness using advanced technology. People coming from the manufacturing industry, managers, engineers, officials and researchers will find in this book a rich source of material for understanding the crucial elements in technology development, and its actual and future implementation.